When you first join War of Conquest and create a player account, a new nation is created for you. 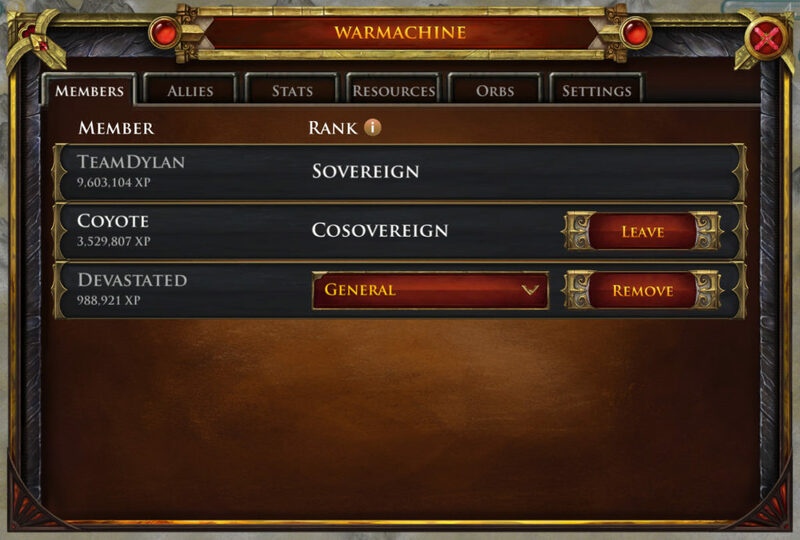 Each player account (username) has its own corresponding nation. However, a username can leave its own nation to join another player’s nation. They can then stay in their new nation as long as they’d like, and return to their own home nation any time. In the Nation panel, under the Members tab, you can view a list of all the members of your nation. When you first start out, you will be the only member of your nation — but if you join a nation with other members in it, or other players join your nation, this panel will list more than one member. Each line in the list shows the member’s name, the number of XP they’ve earned in battle, and their rank within the nation. The line in the Members list for your own username will include a “Leave” button. Hit this button if you’d like to leave the nation you’re in, and join a different nation. You will be asked to enter the name and password of the nation you wish to join. You will need to obtain the correct password from a member of the nation you want to join; this is the password that can be set on the Nation panel’s Settings tab. When you join another player’s nation your rank will initially be Civilian, until another member of the nation promotes you. If you are a member of a nation other than your own, and you hit the “Leave” button, you will first be given a choice of whether to join another nation, or return to your own home nation. You can return to your home nation (the nation that was created for your username when you first created your account) anytime, without the need to know its password. If your rank within your nation is General or above, you can remove other members from the nation by hitting the “Remove” button on that member’s line in the Members list.